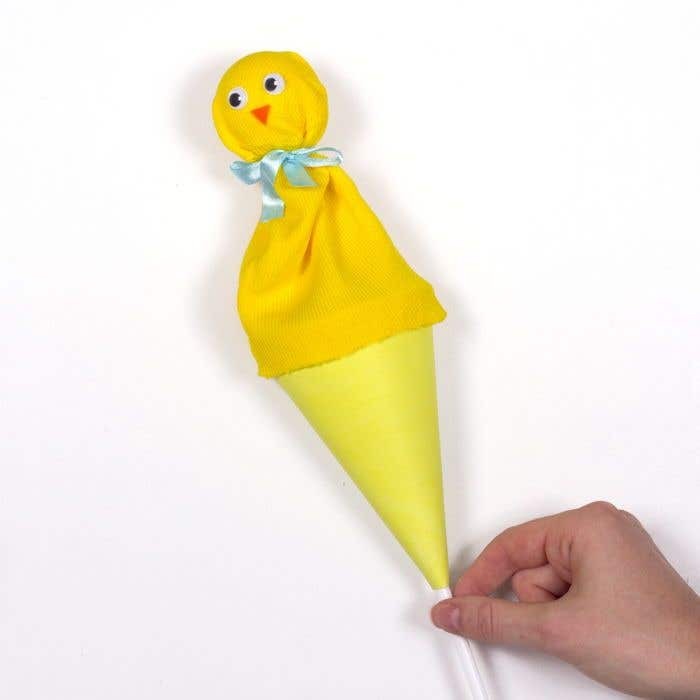 This pop up Easter chick puppet is fun to make and even more fun to play with! Take the cone part of the cone puppet kit and paint it yellow. Leave to dry. Add another coat of paint if needed. Take the plastic stick from the puppet kit and push it into a medium sized polystyrene ball. It should hold in place, but if it feels loose and some glue to make it more secure. 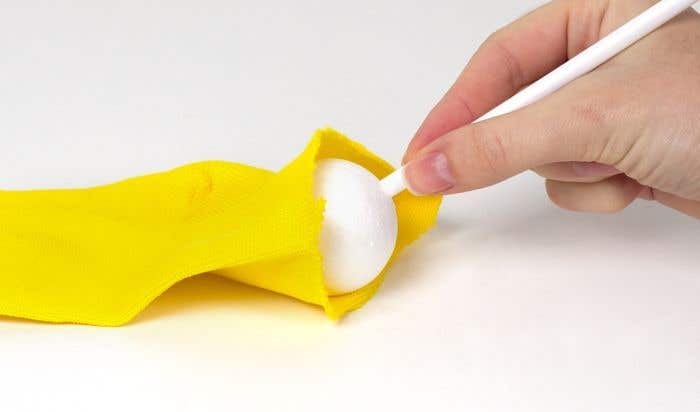 Push the polystyrene ball and stick into a yellow sock until it reaches the tip of the sock. Then tie a piece of light blue ribbon into a bow around the sock just below the ball. 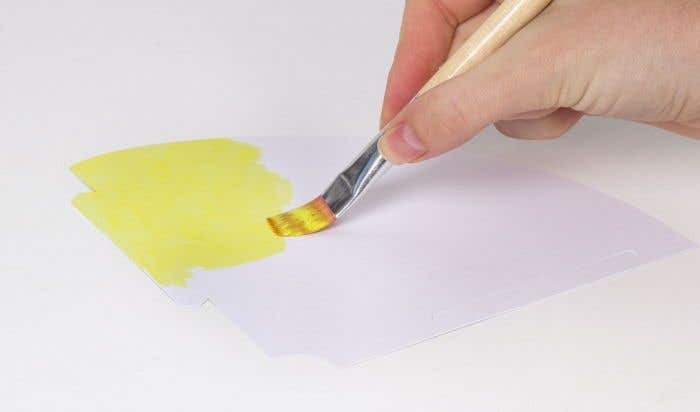 Make the cone shape from the painted piece of card and stick it with tape to make sure it holds. Push the plastic stick down through the hole in the bottom of the cone shape and pull the sock over the outside of the cone. Trim the sock if necessary, then stick the edge of the sock to the top of the cone using double-sided tape. 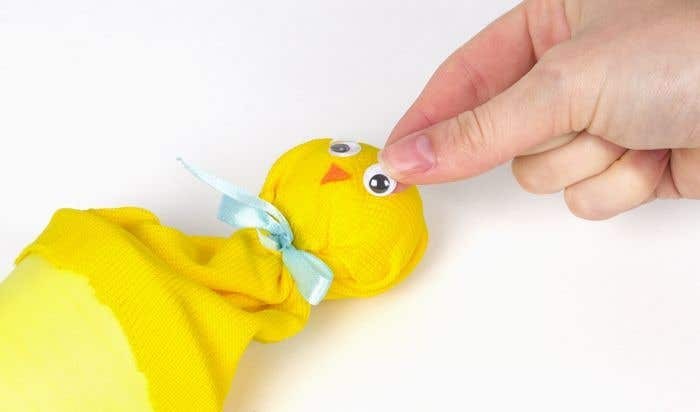 Add a beak to the chick using orange self-adhesive felt, then stick on two wiggle eyes. Pull the stick downwards to hide the chick in the cone, then push it up to make the chick pop out. Try making different Easter characters with different coloured socks.